This is the main part of my desk. It’s the home for the PC, the cutting mat and a large bin organizer that has yet to be populated with bits and goodies. The art on the wall is some concept art from Templecon’s Iron Arena (Una, Aby2 and a Nephilim Bolt Thrower) and the color picture there is a signed print by Florian Stitz (“Trolls of the Mountain”). I still need to get a proper frame for the amazing Plarzoidasaurus logo hand-crafted by BobaFerret herself, which will go up right above the PC monitor, on the right-hand wall. Currently on the cutting mat is my Shattered Sword Starter box and a unit of Purifiers (for an easy 35pt force) – they’re all cleaned and in the largest pieces I’ll have them in until painting is finished. 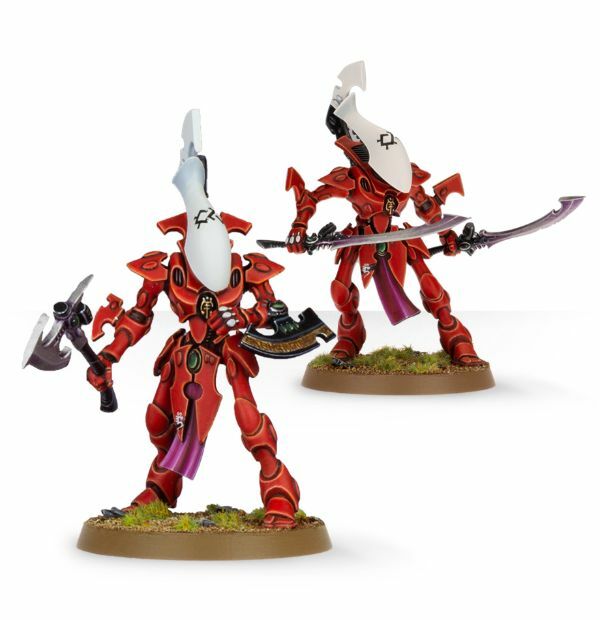 Also, there’s a single Eldar Wraithblade with a pair of Ghost Swords. He’s a competition piece. There’s a Nemo2 and a Firefly for Clash for a Cure (I’ve been asked to paint this year, not just assemble), and a Blood Angel Sanguinary Guard (competition mini). Lastly, there’s a Lizardmen Temple Guard, a Dark Elf Corsair and the Chaos Lord from the Dark Vengeance set (who happens to be missing an arm right now for some reason). Here’s a better shot of the whole desk. As you can see, there’s three main parts. The Assembly Station, the Computer Station, and what will be the Painting Station once I get everything in Assembly airbrushed. Note the gigantic pile of Chipotle Napkins. I still say they’re the best for painting. They don’t give up fibers which end up on your models, they don’t fall apart, and they come with Chipotle. I;d love them even more if they were white, and didn’t mess with color tests. Anyway, the Raiders poster covers up the gigantic metal panel for the house’s circuit breakers, and the other framed picture there is another signed art print by Florian (“Fighting for Llael”). Also, Diet Coke, Kit Kat and Doritos. I have no shame when it comes to snacks. Next up is the gigantic cube-o-saurus. It’s currently housing all my unbuilt models, basing material, and alternate games. And that’s just the top two rows of boxes. The third row has my terrain box, mobile hobby kit, compressor and tournament kit, and my current bits box and bag. Up top are all my Battlefoam trays of built (and a few painted) models. The bottom box is electronics gear (5.1 surround sound system, power bricks, USB cables, etc). The middle box is misc large hobby stuff (light box, lights, etc), and the top box has all my small hobby stuff (paint additives, airbrushes, empty bottles, etc). The power station there was given to me by a good friend who moved away. It needs to be finished and then painted. I hope I can do as good a job as he did on it thus far. Lastly, there’s the odd corner between the two doors. Left goes to the rest of the basement, right goes to a bathroom and laundry. The neon clock is a gift from my Dad, who is a baby boomer and into all things 50’s through 70’s. I think it’s pretty slick, though the green light won’t be on often as it tints the entire room green and throws off my colors when painting. On the shelves below are my playing card collection (one decent sized box thus far) and the few model car kits I have that aen’t in long-term storage. There’s a Ferrari Enzo, a handful of WRC cars and a lone racing bike – all Tamiya (of course). The green shoebox happens to have every MKII book int, save the Mercs and Minions Forces of books. So, now that’s the tour. Have you been or would you be interested in seeing miniatures from other manufacturer ranges? … how about things outside gaming like model cars, model trains, historical miniatures or busts? … how about electronics and programming, as they apply to lighting / animating models or terrain? ■Have you been or would you be interested in seeing miniatures from other manufacturer ranges? If they’re useful for showing off techniques or just generally cool, sure. ■… how about things outside gaming like model cars, model trains, historical miniatures or busts? Historicals bore me because they’re “supposed” to be painted with a very specific color palette, and they don’t leave a lot of room to free-form. ■… how about electronics and programming, as they apply to lighting / animating models or terrain? I’m always interested in learning about electronics and programming. Do you have specific ideas in mind? I’d like to light up a vehicle – like maybe a Rhino or Tau tank. Use some of my work experience inside my hobby. *Have you been or would you be interested in seeing miniatures from other manufacturer ranges? 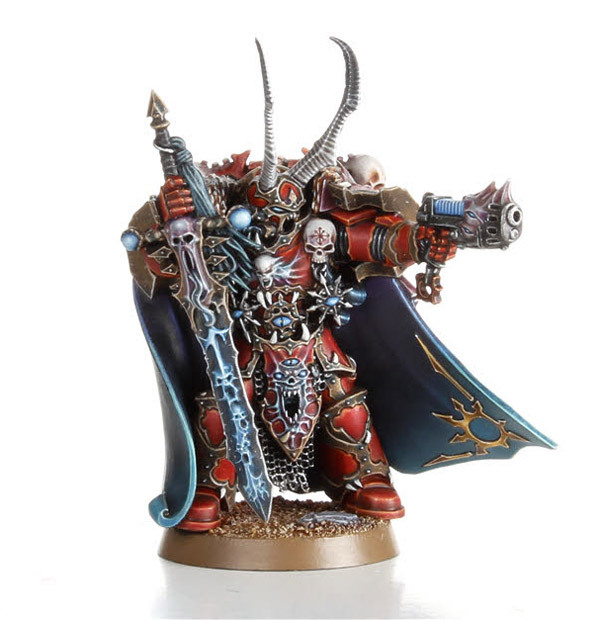 I’m intrested in miniatures from anything as I think looking at other miniatures and paint schemes/painting is a great source of inspiration for painting my own models regardless of genre or game. *how about things outside gaming like model cars, model trains, historical miniatures or busts? Same as above as they can easily relate back to Warmachine models. Model cars and train painting techniques can be used on warjacks, battle engines, and colossals. Historical models and busts can relate back to smaller models. *How about electronics and programming, as they apply to lighting / animating models or terrain? Even for someone like me who knows nothing about electronics, its interesting to see what other people can do and can be inspiring on its own. How about things outside gaming like model cars, model trains, historical miniatures or busts? How about electronics and programming, as they apply to lighting / animating models or terrain? – Again, yes! I’m in the middle of using PoweredPlay’s kits to light my Prime Axiom and Stormwall. Would love to see other people’s takes on this side of hobby-ing. I thought you were already sharing minis from several different game systems. Whatever keeps you motivated to paint and blog about your techniques will keep your readers interested I think. Personally I have found Most (but not all) minitures that included LEDs and such kind of toy looking. But I think exploring it is the only way to get better so I applaud anything anyone wants to try out. I think terrain is a great way to explore because you aren’t so limited by the model itself. Post apocalyptic westerns are something I dig, so choo choo mama. Good set up, my hobby room got turned into a nursery and I have had to move all my stuff into the box room. Currently everything is in boxes stacked on top of one another. I need to build some shelving and sort it out. ◾Have you been or would you be interested in seeing miniatures from other manufacturer ranges? It is a dangerous answer, but yes. It is always good to see what other manufacturers produce, especially if you have not seen or heard of them before. Although that can lead down the dangerous route of building yet more miniatures/games. But it can also lead to some excellent conversion ideas or proxy models for games that you already do play. ◾… how about things outside gaming like model cars, model trains, historical miniatures or busts? The painting and modelling side of our wargaming hobby is applicable to all sorts, and we can learn stuff from those things too. I have to admit I am less interested in seeing some things, in particular the busts. ◾… how about electronics and programming, as they apply to lighting / animating models or terrain? I have a Merc Galleon that is partially built because I was trying to light it up. So the more I learn about electronic wizardry the better lol. I like the painting setup, but where are the paints and lights? I am guessing they haven’t been unpacked/sorted yet. I am trying to get a spot cleared off for airbrushing, not going to well…. 1) Yes! I like seeing other miniatures and whatnot that goes with them. I do have control on my case of the shinies. (for the most part) So am not worried about starting a whole other game. 2) Model cars, and trains I am not too interested in, but if you can relate it to painting or terrain making then I am all good. Busts are always fun, as they are much larger and take different techniques. I find I can scale down some of the effects for busts onto miniatures. You can learn a lot about your skill level from painting something that large. Historical miniatures I would like to see very much. Most of the miniatures I paint or historical. I also have a deep obsession with muted natural colors, so they tend to work better with the historical end. 3) I think it would be interesting to read about lighting and animating models and terrain. I have three roommates who all have degrees in the video gaming industry. One programmer and two artists, so learning more about animating and programming might make me sound more knowledgeable when they discuss those topics! Also learning how lighting works helps with painting highlights and OSL. All in all, it sounds like good ideas. I like blogs that are not focused exclusively on one subject. They tend to get very in depth, but usually lack the amount of content that blogs that have multiple subjects do. Higher content levels are usually good, as long as they are thought out well. A unfinished or half a** blog post isn’t much fun to read, and if they keep showing up it makes returning not as worth it. All I can say is keep coming up with different content, and keep up the good quality. People will flock to blogs that have that. I keep most of my paints in my Battlefoam P3 case, which is hiding under the desk. It’s not terribly organized, but it’s portable. I should probably get my paint rack set up, though, as painting on the go is rarely productive. The only light I have is the ring light there off the right end of the table. I want to get an Ott Light, though. Ott brand lights are a lot overpriced, there are other lights you can get with the same kind of lightbulb and some even fit Ott light lightbulbs. Ott lights are pretty expensive. I have one, but I got it at a going out of business sale at a local craft store a couple of years ago. If you can find something similar for cheaper I would go for it. They are really nice, and I have had mine for two years and have not had to replace the bulb, but I have seen their normal prices. In the end, if you can afford it by all means get it. I always find a little bit of researching helps out a lot, but for me time is worth less than money. I also find that painting on the go is rarely productive. I tend to talk with friends and help out others more than get any actual painting done. But I still enjoy it as I can socialize with friends and have a good time. I have a paint rack that holds most of my paints, and enjoy the ease of access and organization that comes with having it. I still take my paints with me when I go to paint elsewhere, and have quite a big bag to get it organized. It takes time to pack up and put away, but I rarely do that more than once a month. So for me the key is keeping everything close and at the ready at home. What company did you get your paint rack from? Mine is starting to fill up, and am looking to add another rack.